While a lot of work has been done on tone and intonation, there has been no large-scale test of whether lexical tone and intonation are, in fact, in competition diachronically. If a functional dependency between lexical tone and intonation exists, tone languages should be more likely than intonational languages to develop grammatical devices to encode utterance-level meaning such as particles, word affixes, and changes in word order. On the other hand, if an optimal division of the phonetic space between lexical tone and intonation is often reached cross-linguistically, tonal and intonational languages should exhibit grammatical devices for encoding utterance-level meanings at a similar frequency. A recent paper by Francisco Torreira, Harald Hammarström and myself uses two typological databases to tackle this question (link to paper). We used data on lexical tone from WALS and the ANU Word Phonotactics Database. We also coded languages according to whether they could use various grammatical means of marking polar questions (yes/no questions), or whether they could use interrogative intonation only (link to WALS feature). The result was data for 307 languages from WALS (see map below) and 593 languages from the ANU database. Fisher’s exact test to determine whether there is a skew in the distribution of languages with lexical tone and languages which use question intonation. 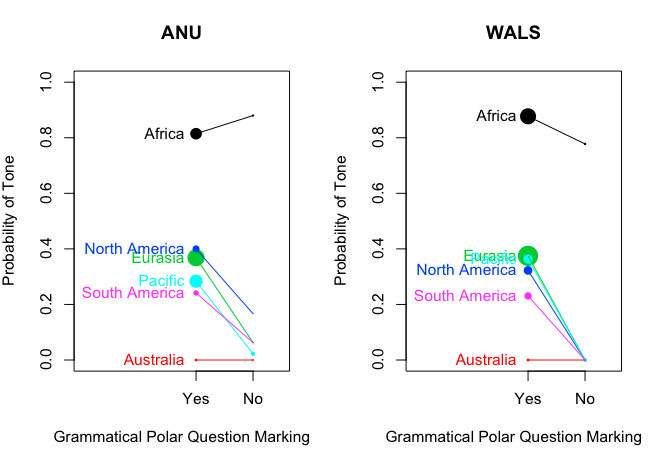 A mixed effects model predicting Grammatical Polar Question Marking (GPQM) by lexical tone, controlling for language family, genus and geographic region (for both WALS and ANU tone data). A Phylogenetic Generalised Least Squares (PGLS) regression to test whether the existence and complexity of a tone system in a language predicts GPQM, controlling for phylogenetic relationships between languages (for both WALS and ANU data, based on phylogenies in Glottolog). This test has a finer-grained control of historical relationships. A serendipity test to compare the strength of the relationship between tone and GPQM with the relationship between other variables in WALS. The probability of a non-lexical-tone language having some grammatical means of marking polar questions is quite high (73%-85%). The probability of a lexical tone language having grammatical means of marking polar questions is significantly higher (88%-98%). Tone and intonation are more strongly linked than 97% of other WALS features. The change in probability rises steeply from languages with no tone system to languages with some lexical tone system, but does not increase in languages with more complex tone systems. Estimated probability of exhibiting grammatical polar-question marking for languages with and without a lexical tone system. Results from the ANU database. 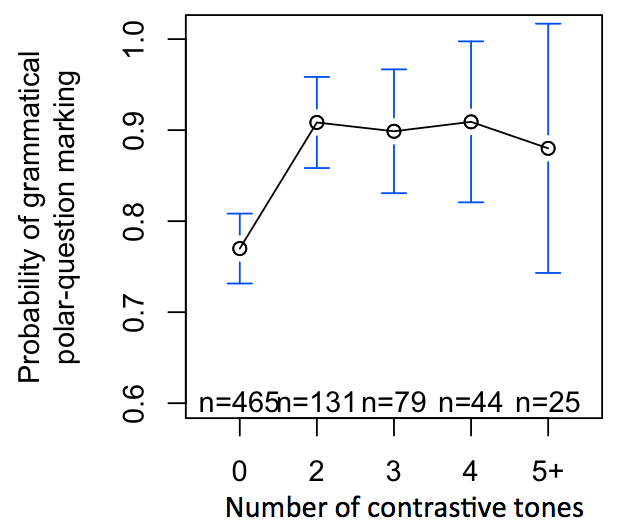 Languages with grammatical polar question marking are less likely to have lexical tone. Points are scaled by number of observations. Point sizes are scaled to number of observations. We conclude that there is strong support for a functional dependency between lexical tone and question intonation: Lexical tone languages tend to avoid potential conflicts with utterance-level intonation by making use of grammatical devices. However, the dependency itself is not a strict rule, but a statistical tendency. You can read the details of the analyses here. The next question is the direction of causality. It would be possible to test different models of cultural evolution to determine the probability of a language gaining or acquiring tone as a function of gaining or acquiring question intonation (e.g. using Bayesian Phylogenetics). However, at the moment we don’t have enough data on marking question intonation within a single language family to carry out such an analysis. Getting solid data on whether a language can only use intonational means of signalling questions is also tricky, since many grammar descriptions see this as a peripheral issue. We also hope to expand our analyses in the future to other aspects of intonation. We hope we’ve shown that it’s possible to robustly demonstrate a linguistic dependency with a range of data sources and methods, controlling for the effects of genealogy and geography. Torreira, F., Roberts, S. G., & Hammarström, H. (2014). Functional trade-off between lexical tone and intonation: Typological evidence from polar-question marking. In Proceedings of the 4th International Symposium on Tonal Aspects of Language. Link. Alternative Link.